All sales on this item are final and no returns will be accepted for any reason. Please note: This item is being sold as cosmetically damaged. Damage may include but is not limited to bent corners, seam splits, cover creases or tears, etc. REO Speedwagon have been a favorite rock band of choice in the hearts and minds of classic rock music lovers for many years now. Led by the dynamic vocalist and front man Kevin Cronin, this powerful quintet hit the top of the charts with their mega nine-times platinum Hi Infidelity in 1980, and as time has been good to them, the album firmly places them as one of the industry's most popular acts of all time. 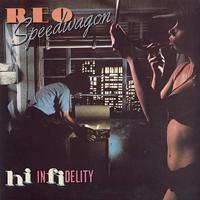 Jam packed with four hit singles and six unforgettable album tracks, Hi Infidelity kept REO Speedwagon all over the radio dial and packing in concert arenas ever since.